Giuliani said it was important to end the investigation “so we don't get into what I call ‘Comey territory.'" 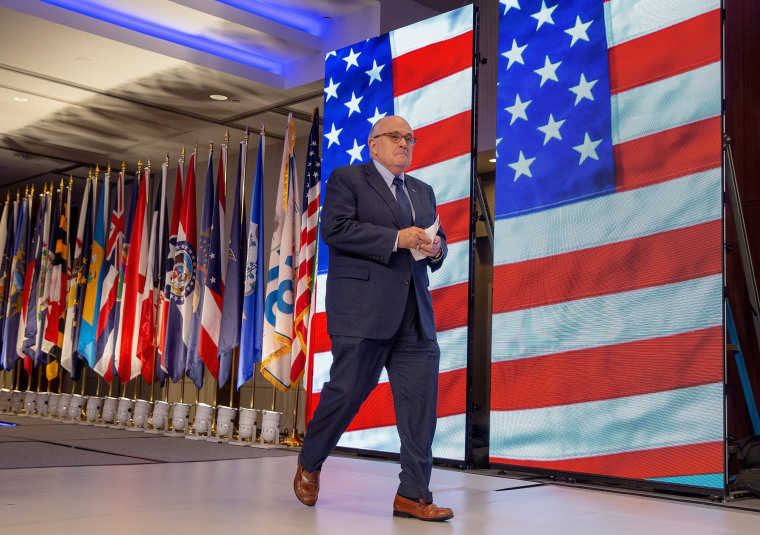 Special counsel Robert Mueller could conclude the part of his investigation looking into whether President Donald Trump obstructed the Russia inquiry by September, the president's lawyer Rudy Giuliani said Sunday. Giuliani said it was important to end that part of the investigation "so we don't get into what I call 'Comey territory'" — a reference to James Comey, the former FBI director who alerted lawmakers to the agency's reopening of a probe into Hillary Clinton's emails on October 28, 2016, just days before the presidential election. Clinton has partly attributed her loss to Comey's letter. Guiliani said a similar move before the midterm elections in November "would be unfair." He added that, during a recent meeting, the special counsel's office proposed a potential end date of September 1 for parts of the inquiry relating to the president. A spokesman for the special counsel did not respond to a request for comment on Sunday. NBC News has previously reported that Mueller was likely close to finishing the obstruction investigation, which began after Trump told NBC Nightly News anchor Lester Holt that he fired Comey because he believed the investigation of Russian interference in the 2016 election — and possible conspiracy with the Trump campaign — was "a made-up story." But experts believe the investigation into interference, which could involve digging into complex corruption and financial schemes, may just be beginning. Former federal prosecutor and NBC News analyst Chuck Rosenberg said that one year in such an investigation "is a blink of an eye." Trump, meanwhile, tweeted on Sunday that the inquiry was "the world's most expensive Witch Hunt" that has "found no Collussion with Russia, No Obstruction." The special counsel's office has so far charged three Russian companies and 19 people, including former senior advisers, in the inquiry.